Kmart has been known to push the envelope when it comes to advertising. Last year alone they had people talking about everything from their "ship my pants" advert to the Jingle Balls of Christmas celebration. For autumn winter, Kmart is focusing on their new tool to order online and pay cash in store. To celebrate this innovative way to shop, they've enlisted the help of a cool grandma. 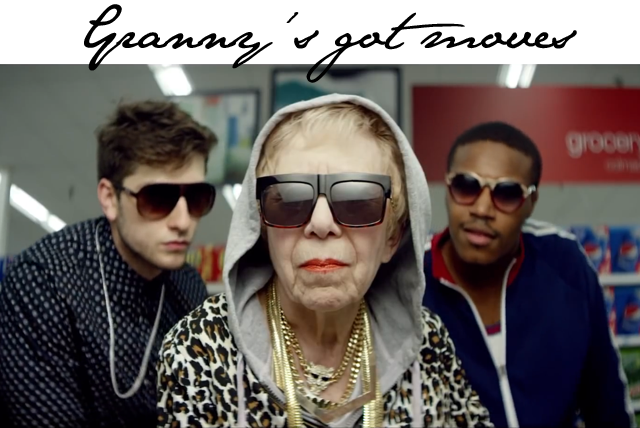 Let's just say she's the coolest grandma I've ever seen out in about, with her leopard print hoodie, gold chains for days and a bootie that just doesn't stop shaking.